As tunnel boring for the University Link light rail continues underground, city, transit, and neighborhood leaders are hashing-out street-level development plans for the Capitol Hill station. Capitol Hill TOD Champion group leader Cathy Hillenbrand led a discussion on possible uses for one of four land parcels identified for redevelopment. 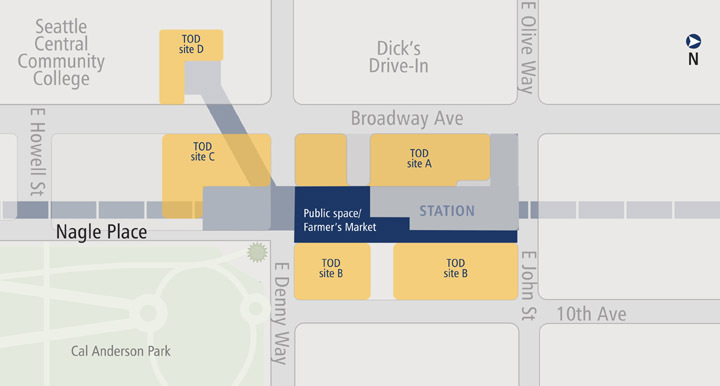 The group seeks to promote community concerns on the Capitol Hill Station – TOD (transit oriented development) site. Members of the group said they are hoping to secure space for an LGBTQ youth center in one of the buildings. Others discussed the possibility of several non-profits occupying one building to create a “one-stop-shop” for social services. Several meeting attendees voiced support for a 8-10 story, “neighborhood defining” structure that would house a mix of retail, office, and residential space. Hillenbrand said she would relay the comments to city and Sound Transit officials. Two Sound Transit community liaisons were also on hand to announce the imminent meeting of the north and south tunnel boring machines. The north bound machine is currently between Thomas and John, while the south bound is at Republican. No word on the exact meeting date, but officials said crews are aiming for a daytime breakthrough for optimum media exposure. Bottom line: Let’s not create another Beacon Hill station. – Reduced parking rate south of E. Olive/John Streets to $2.50/hr. – 3-hour parking after 5 p.m.
– Introduction of tiered rates in high-use areas, including Broadway blocks north of Olive. Bottom line: Parking fees going up and down, longer parking times to come. Rebecca Herzfeld presented her concerns with the mayor’s “Regulatory Reform Proposal,” which would allow commercial development in low-rise multi-family zones. CHS recently reported on the proposed changes and Herzfeld’s efforts. The regulations are going before the city’s Planning, Land Use, and Sustainability Committee on March 29th at 9:30 a.m., with an additional public comment meeting to be held at 6:30 p.m.
Bottom line: Proposed regs will sully neighborhood vibes. Two members of a group opposed to the city’s planned Yesler Terrace Redevelopment project presented their concerns with the massive neighborhood overhaul. Bruce Bowden of Citizens Rethink Yesler, said he supports some redevelopment in the area, but that the current plans to replace single-family units with several towers would increase traffic and remove existing green space. Bottom line: Yesler Redevelopment is too damn high. Saving the Volunteer Park Conservatory — The group Friends of the Conservatory have kicked off a fundraising effort to amass $3.5 million for renovations to Volunteer Park Conservatory buildings that have fallen into disrepair. CH Times changes owners — Stephen Miller, recently appointed editor of the Capitol Hill Times, said the paper’s new management is breathing new life into the paper with a revamped print and online design. 12th Ave. group gets grant — CHCC’s 12th Avenue Safety Committee received a $17,000 grant to continue their efforts to improve bike and pedestrian safety along the street. Committee leader Mike Kent said the group is finalizing its recommendations report and encourages public input. The Capitol Hill Community Council is open to everyone who lives and works on Capitol Hill. Meetings are held at the Cal Anderson Shelter House on the third Thursday of every other month. For more information visit capitolhillcommunitycouncil.org. Agreed — kudos to the Council for doing a great job on documenting and then making them available so quickly. It really makes the council something everybody (more easily) can be part of.